A classic piece of 1930s art deco furniture. This highly sought after rocket design china cabinet in figured walnut has been recently been acquired from a local house clearance where it has been in the family for many years. 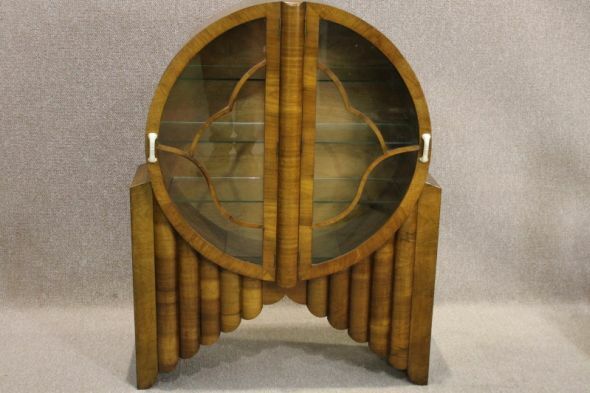 The cabinet has all of its internal glass shelves, and is in beautiful condition for its age; ideal for any collector. Unfortunately, there are a few small woodworm holes to the one side and to the rear board of this art deco rocket china cabinet which we have clearly photographed. This is well and truly dead; treated by the previous owner and ourselves.